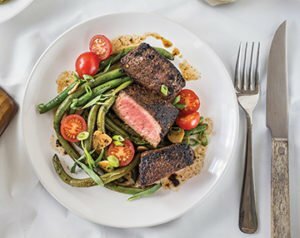 Goodfood sells a meal kit in a box, delivered to your door, complete with instructions and every item you’ll need to make a nutritious, gourmet meal. It’s a beautiful niche, combining a number of trends that dominate our lives – the foodie obsession, online ordering and food delivery. The founders of Goodfood (Goodfood Market Corp) were confident they had a good model when they started up in 2014, but they could not have anticipated the phenomenal uptake of their service. 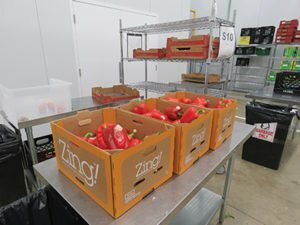 Next stop, in February 2016, Goodfood moved to a 15,000 square foot facility, with a proper walk-in refrigerator, a freezer and a jump from 25 to 150 employees. Cuggy points out that part of the reason for starting so small was funding. In the first year the business was entirely self-funded by the three co-founders’ life savings, while their spouses supported them. In the fall of 2015 they raised about $1 million from three outside investors, which enabled the February 2016 move. At this time they were shipping out about 150,000 to 250,000 meals a month. But the orders kept coming and space was getting tight again. With their finance savvy, the founders decided it was time to look for more capital. And in May 2018, after securing other investment, they completed a public offering and issued 4,000,000 common shares for gross proceeds of $10,000,000. The company’s main production is now housed in an 85,000-square foot-facility, with a front office and massive, temperature-controlled production facility. Cuggy says they plan to take over the second half of the building – another 75,000 sq. ft. – to accommodate continuing expansion. Goodfood is sending out over one million meals a month now, to 89,000 subscribers across Canada. In May 2017 the company had just 23,000, so that growth is substantial. Cuggy believes they can produce and distribute two to two-and-a-half million meals in the current space. The Montreal DC serves Ontario, Quebec and the Maritimes. 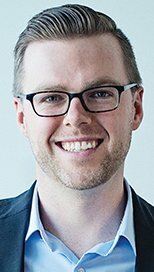 Part of the public offering capital was dedicated to opening a second distribution operation in Calgary, which opened in April, and serves the four western provinces. They employ 150 in the office and about 650 production staff, across the country. Shipping a million meals a month requires some careful planning. And as Cuggy notes, he and his partners started in the business as finance guys, not operations managers, so there have been some key lessons learned. They also rely on help from Deloitte, in the form of a couple operations consultants who keep production and distribution moving. The million meals a month breaks down to an average of seven and a half per box, 135,000 deliveries a month or 30,000-35,000 a week. The company uses regular delivery services, not temperature-controlled vans, to get the meals to customers in good condition. “We focus on the packaging of the food and maintaining refrigeration in the box that we ship in, rather than maintaining refrigeration in the reefer trailer or the delivery truck,” he says. The key is the box they use, which was developed by Cascades for use in perishables shipments. Customers can order between six and 18 meals a week, meaning a wide number of combinations that need to be packed. Everything goes into one of two box sizes Goodfood uses, packed on top of single use cold packs. 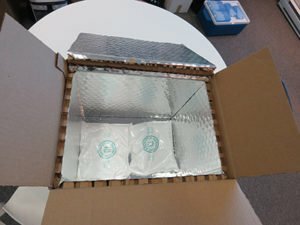 Depending on the season, the liner of the box is changed out for a thinner or thicker version. For now the packaging is recyclable but not returnable, although Cuggy notes that they are considering using returnable totes, even though they entail a considerable increase in delivery complexity. Adding to the complexity is the fact that the menu changes every week, with different cultural representation each time. “One week we’ll have Indian dishes. The next week we may not have Indian dishes. It may be Mexican dishes. So it’s not the same supplier that we’re going to, to get Indian spices or naan bread as we are to get corn tortillas or Mexican crema,” Cuggy says. The company deliberately works at cultivating and investing in smaller suppliers who deliver specialty items like fresh pasta, for example. “We say, ‘can you scale with us? 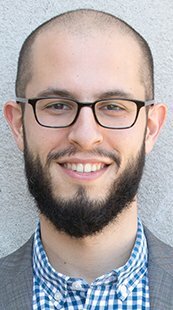 Do you need money?’ That it is the stuff that the client actually values in the long term,” he says. They try to minimize the amount of stock kept on hand, and keep orders as close to actual demand as possible. 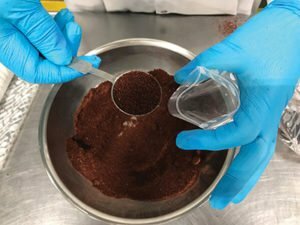 “We receive all of the orders from our clients and payment from our clients before placing orders with any of our suppliers, so that really allows us to grow to $100-plus million [the company’s current sales], but not with investing significantly in any inventory or even in any infrastructure, because we can say, “Okay, deliver spinach every six hours for us.” We don’t have the room to store more than two pallets,” Cuggy notes. Food comes in to the facility on a 24-7 basis, and is turned over extremely quickly. Cuggy says inventory control has never been their strong suit, because it hasn’t needed to be, with small quantities being quickly broken down and packed into portions then allocated to the dinner boxes. The quick turns also mean the facility goes without racking, storing palletized goods on the floor. Cuggy said it just didn’t make sense to have people and equipment dedicated to loading and unloading fast-moving product into racking. For the next phase, however, they are looking at a narrow-aisle solution. In the production area, stainless steel workstations are crowded with white-clad workers, quickly processing ingredients and packing meal boxes. It’s Friday, one of the busiest days on the floor, preparing meals for Saturday deliveries. The current building has some challenges, including a slightly awkward setup requiring inbound loads to traverse the production area for put-away. As well, Cuggy notes that the building was not food grade when they moved in, necessitating significant upgrades for temperature control, smoothing out the floor and better lighting. “You need a certain level of luminosity for food grading,” he notes. Spices are packed into zipper bags to be added to the meal kit. 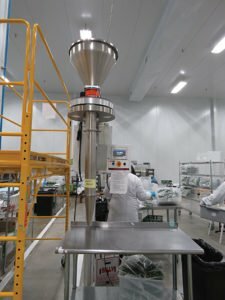 They’re recently introduced automation in the form of volumetric hoppers to portion items like grains and dried fruits. The machines operate alongside staff who inspect every piece of incoming produce to an incredibly high standard. Unshipped food is made available to staff; Cuggy says most workers take home at least a bag of groceries a week. Each box contains the ingredients for every meal, along with recipe cards. 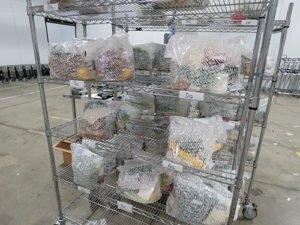 Everything is individually packed into plastic bags, or deli containers, from spice packs, to dry goods, to veggies and proteins. Cuggy says that plastic waste is one of the main feedback points they hear from customers, so they have moved to branded plastic bags because “it doesn’t feel like a piece of plastic as much if it is just a ziploc bag.” Goodfood is working to reduce the packaging feel in general, and the impact, he says. Cuggy and his colleagues started the business thinking it would serve young professionals like themselves, but they’ve found a larger niche as those people grow into family life and require larger more complicated meals. As well, he notes that empty-nesters are adopting the model because they like to hobby cook, and Goodfood makes it easy for them. It’s not just urbanites buying the product, but people in rural areas who have figured out that Goodfood is often the only source for some more exotic or unusual foods in their area. Ultimately, Goodfood is trading on the notion that everybody has to eat, and tailoring it to current trends and demographics. As they note in their investor relations materials, “The meal-kit subscription service industry is one of the fastest growing industries in the world and remains relatively new in Canada.” That’s a nice niche to own.